In 9 A.D., the 17th, 18th, & 19th Roman legions and their auxiliary troops under the command of Publius Quinctilius Varus vanished in the boggy wilds of Germania. In 9 A.D., the 17th, 18th, & 19th Roman legions and their auxiliary troops under the command of Publius Quinctilius Varus vanished in the boggy wilds of Germania. They died by the hundreds over several days in a carefully planned ambush led by Arminius—a Roman-trained German warrior adopted and subsequently knighted by the Romans, but determined to stop Rome's advance east beyond the Rhine River. By the time it was over, some 25,000 men, women, and children were dead and the course of European history had been forever altered. "Quinctilius Varus, give me back my legions!” Emperor Augustus agonized aloud when he learned of the devastating loss. As the decades slipped past, the location of the Varus defeat, one of the Western world's most important battlefields, was lost to history. It remained so for two millennia. Convinced the running battle took place north of Osnabruck, Germany, Clunn set out to prove his point. His discovery of large numbers of Roman coins in the late 1980s, followed by a flood of thousands of other artifacts (including weapons and human remains), ended the mystery once and for all. Archaeologists and historians across the world agreed. Today, a multi-million dollar state-of-the-art museum houses and interprets these priceless historical treasures on the very site Varus's legions were lost. 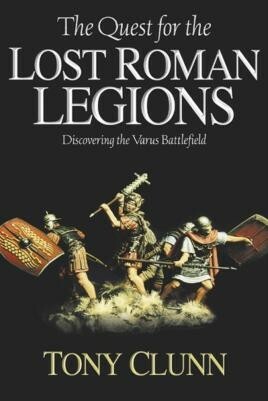 A masterful retelling of the search to discover the Varus battlefield, Clunn alternates between his incredible modern quest, and the ancient tale of the Roman occupation of Germany (based upon actual finds from the battlefield) that ultimately ended so tragically in the peat bogs of Kalkriese.